Apple iOS 11 launched on Tuesday, September 19, which was exactly one week after the iPhone 8 and iPhone X launch event. It’s come out of beta after a four-month test phase. 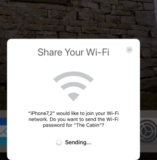 The apple iOS 11 update comes with some pretty significant features added to the OS, but one of my favorites is the ability to share Wi-Fi logins and passwords in between iOS 11 devices. With this featured upgrade iOS users can easily allow their friends, loved one’s and family to connect to their network easily with just one tap. Apple iOS 11 includes many automatic features regardless of the features first-time setup and account login. This improve features extends to WiFi networks also. Hence if a friend comes over with an iPhone running iOS 11, you can easily log them in to your WiFi network in just one tap and no stress attached to it. Apple iOS11 UI system looks like that of the AirPods pairing processes. 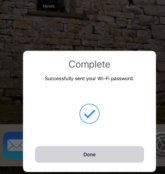 Which helps the WiFi password screen pops up on every new device, and other nearby iOS 11 devices that are already connected on the network will then try to help the new device. 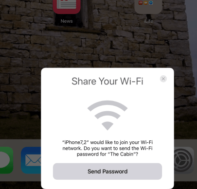 With this new feature friends that want to connect to your Wi-Fi network can just pull up the Wi-Fi login screen and select the desired network, as they normally would, but then rather than having to enter the password, they will only just need to bring their phone near an already connected iPad or iPhone. You’ll then see a pop up on your device asking if you want to grant permission or access and it’s as easy and simple as that. This new features have save the stress ofloging into your router looking for passwords and then you don’t have to go find the WiFi password on the back of the router anymore wait for that kind that has changed the password to come back from school. Just tell your guests to tap on the network name and accept them with a tap on your personal device. The only requirement is that the iPad/iPhone that runs an iOS 11 with the password at a close range and unlocked. Although this is a small thing that you will only use a few times yourself to catch fun and save some stress and then occasionally when new friends and families come over with iPhones or iPads, but it’s a great example of continuous refinements and improvements seen across iOS 11 features. So go ahead and enjoy your new iOS 11 features. ← How to configure Remote Desktop and Virtual Network Connection.